Rosie Sayle who is the licensee of the Sulby Glen Hotel has spoken of the devastating effects the foot-and-mouth crisis and the cancellation of road racing has had on her business. Rosie appeared before rent and rating appeal commissioners on Wednesday to tell how she was 'fighting for survival'. 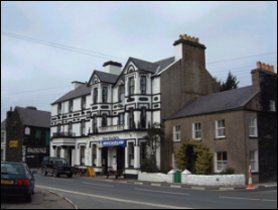 The sitting in Douglas heard how badly she'd been affected by the scrapping of the TT, Southern 100 and Manx Grand Prix due to the risk of foot-and-mouth disease as well as restrictions which led to the closure of the Wildlife Park at Ballaugh, the Claddagh campsite and parts of the countryside. She said she was in a 'desperate situation' and claimed she had suffered from a 'substantial loss of trade', but added she had not laid off any staff yet. Mrs Sayle appealed against the amount of rates she had to pay. 'I'm here asking for some assistance,' she said. Chairman Norman Teare said the panel could amend the rateable value of the premises.